What equipment do you need for the Venus Factor Workout? You are here: Home / Exercise / What equipment do you need for the Venus Factor Workout? and is in the best shape of her life. The beginner workout is one hour for three days a week. If you are a beginner and new to exercise you can break up the sessions. For example you can do one set of everything and that would take 20 minutes a day. Everyone starts somewhere. All that matters is that you start and then build up your strength from there. You can also modify exercises to your own level, you can do pushups against a counter until you build strength, or start them on your knees. No matter what your level you use the correct size dumbbell weights for you and then work your way up. It does not matter what weights someone else uses. All that matters is that you start at your own level and build your own body and your own strength. Sometimes when you are just starting you can do the exercises with no weights, and you can hang onto something to help keep your balance if you need to until you build up strength. Shannon is one of our veteran Venuses who has lost weight and also maintained her new shape with the Venus Factor for several years now. 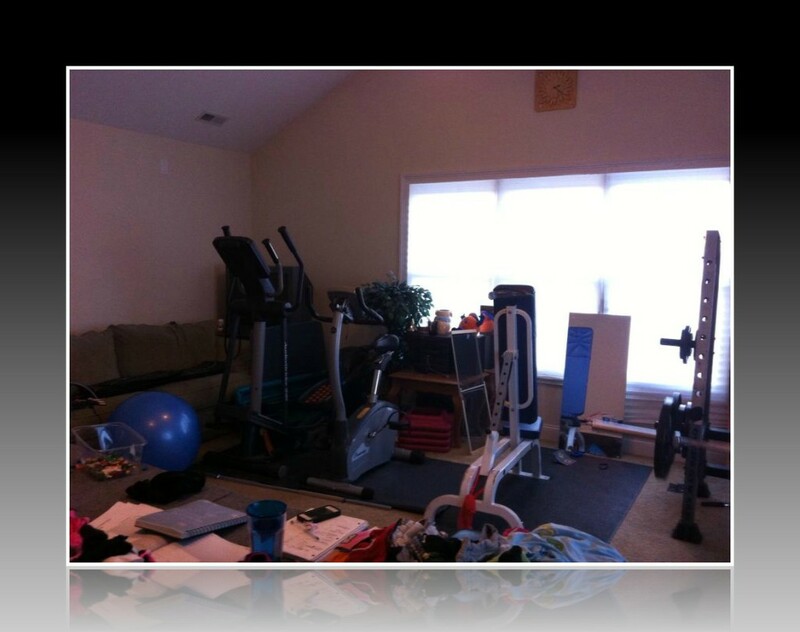 She recently started a thread in our online community explaining the workout equipment she purchased for her home. What about doing other workouts along with the Venus workouts? We encourage you to do all the exercise you enjoy. The three day a week Venus workouts are perfect cross training for many activities. I have found that the Venus workouts improved my running performance. 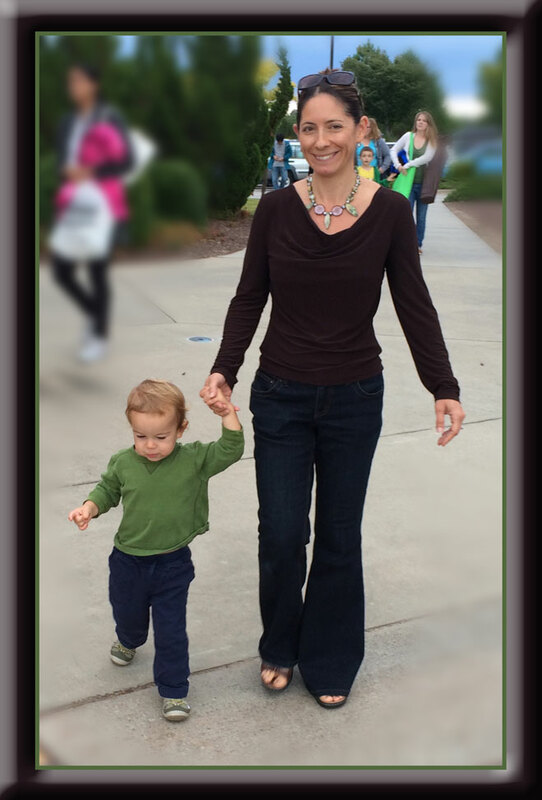 Recently I found that my strength gained with the Venus Factor workouts were put to the test. The Venus workout is designed for women to improve the female physique. It also has the added benefit (like any other lifting routine) to improve bone density, health, strength, endurance, and functionality. For many women other more cardio intense workouts might cause extra fatigue, stress, and hunger. I described a recent workout experience where I experienced increased hunger and inflammation, and I’ve also experienced “compensating for the increased energy expenditure by being less active throughout the rest of the day” when I was training for marathons and ultra marathons. If your goal is to lose fat, the longer more intense cardio workouts might contradict that goal. 1.Dumbbells-Some people like adjustable ones. I do too, but I prefer something like a PowerBlock or Bowflex adjustable DB set because I don’t like changing weights on and off a bar with clips when super-setting two exercises back to back. If you want to make it easiest without any need to switch, get solid dumbbells of varying sizes. I would not buy anything smaller than a 5 unless you are totally new to working out. You will outgrow 2’s and 3’s very quickly. Hopefully you have some idea where to start. If you are totally new, maybe 5’s, 8’s, 10’s, 12’s? For back and chest exercises, you may need to go heavier. As you need more, you can buy heavier DB sets. If you have a husband who also works out, you may end up with quite a lot of DBs. We eventually bought a rack ($200) after keeping them on an old coffee table for years! This is in no way required but if you end up buying a set off craigslist, I’ve noticed people selling sets with racks included, it’s a nice to have for organization. Some kind of step or bench for step-ups. An aerobic bench step, or a basic but stable weight bench. The bench will also be useful for chest presses and one-arm rows and other exercises. If you don’t have a bench, you can step up onto something stable like a bottom stair, use a yoga mat for chest presses, and rest your hand on a chair for one-arm rows. Keep in mind at the highest, the highest step you use should probably be about knee height for you (I remember Denise saying that at one point and it definitely works much better for me not to try to step too high.) So while my husband uses the flat bench we have, I use a shorter bench for step-ups. 3. Stability ball. These are pretty cheap and around new years you can pick one up for under $10. They look to be around $20 on Amazon. Read reviews as I’ve found some of the pumps can be less than durable. Be sure to get one that is appropriate for your height, they will say a certain size “For heights 5′ to 5’5”, etc. And never stand on one. One of our stability balls is blue and visible in one of the pictures. If you are getting into the work out at home thing, as we have been doing over the past 13 years, you can accumulate quite a bit of stuff making your home workout area just as good as any gym. Mind you, we haven’t paid for a gym membership in over 13 years…nor have we used this equipment consistently all the time we’ve had it, but have been using most of it very consistently for about 4 years now. 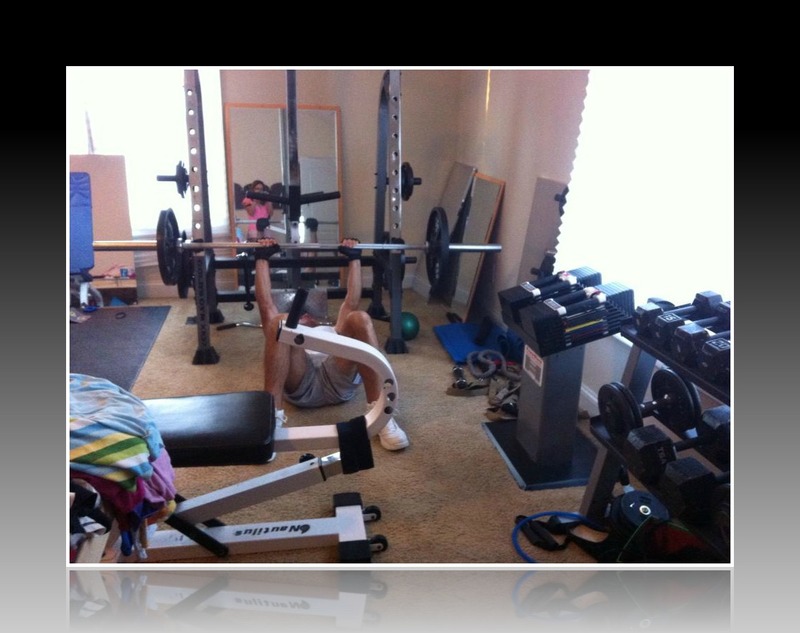 We have a half cage squat rack, which my husband Brian is using for floor bench presses in this picture. It cost us maybe $400 for the cage + barbell weights over 10 years ago. It has a pulldown attachment and seated row attachment and you can use it for barbell squats, bench presses with a bench, use the bar for inverted rows or elevated push-ups, bent over rows, and various other barbell exercises. We have a half cage squat rack, which my husband Brian is using for floor bench presses. To the right of the cage, you can see the PowerBlock adjustable dumbbells on a stand that we picked up used off Craigslist for a total of $150 (new PowerBlock DBs + stand are $800 total on Amazon). In the following picture you can see our poor neglected elliptical and upright bike. 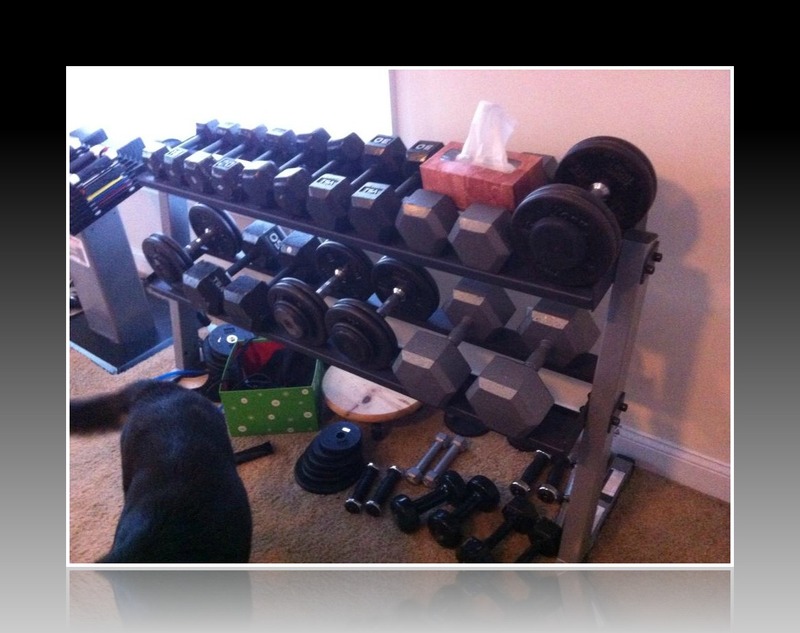 They don’t get a lot of use…To the right is a blue incline bench we picked up off Craigslist for $75. It goes from sitting straight up (I use it for step-ups at this height as it’s perfect for me at 5’4.5″) to pretty far inclined for seated incline presses, curls, etc. Our poor neglected elliptical and upright bike. They don’t get a lot of use…To the right is a blue incline bench. Finally, a flat bench we picked up for $50. Technically it’s an ab bench but we just use it as a flat bench for various exercises. Brian uses it for step-ups as he’s taller than me (5’10”). Technically it’s an ab bench but we just use it as a flat bench for various exercises. We also have a doorway pull-up bar with resistance bands I’ve used for assistance when working up to these. Bands called FitCords (you can get them on Amazon) work well, and you can search band assisted pull-up on Youtube for a video of how to do pull-ups with bands. We also have a TRX which I use occasionally for push-ups and inverted rows and a kettlestack handle which allows you to use standard weight plates to make kettlebells of various sizes depending on your needs. I don’t do much with those right now but they’re good for variety. Anyhow, hope that is helpful to give you a vision of what you can do at home given some space and investment! Gym memberships vary it seems from $10 a month to higher. If you prefer working out at home and have a room or half a large room to dedicate to it, you can definitely apply that membership money instead to giving yourself a nice workout area. The mirrors we have are inexpensive ones we bought and mounted, and some are mirrored plastic film stretched on frames. I like having plenty of mirrors around for checking my form and admiring my Venus body. I’ve found I mostly like to go to a gym but I’m also setup to workout at home. Sometimes we get snowed in and it’s nice to have both options. So what about you? Do you workout at home are at the gym? There are pro’s and con’s. We would love to hear your comments.